In the call center we often think about how we can improve customer satisfaction without increasing our overall costs and keep our costs to a minimum. This challenge is something that all contact centers face on an on-going basis. If your call center satisfies the customers regularly your reputation and business will improve. However, it only takes a few unhappy customers to affect the business name. Preparing the staff properly and keeping them up-to-date is a sure way to keep customer satisfaction going in the right direction. Here are five things that you can do to improve your customer satisfaction ratings. 1. Agent Knowledge: Educate the agents so they truly know the product and services available from the business. Do not assume that because the agent has finished the training class they will remember the products and services forever. Agents often forget some of the important details that can cost a sale or create a very unhappy existing customer. Do not use a script and diagrams as your education reminder with the agents. All of us know what it is like when we are talking to an agent that is reading from a script. Our trust with that agent goes down and we are unsure if the work they will be doing for us will be accurate. Have product and service information for the agent but it should not be used as a script. Listen in on the agent and when they are showing their brand awareness provide immediate feedback. Do not always target the things the agents have done wrong. When they have done something that has created a positive customer reaction congratulate the agent on a job well done. Agents that are having a positive day will reflect on future customer interactions. Compare your agent knowledge to a retail store clerk. If you ask a store clerk a question about the product and they pick up the box and read it to find the answer to your question how sure are you that you have a clerk that knows the product. If the agent is reading a script or a manual to the customer it will show and the customer satisfaction ratings will drop. 2. 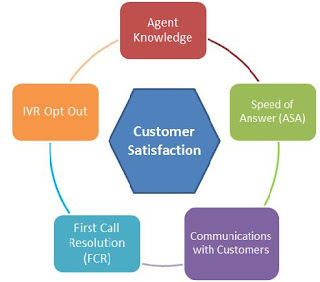 Speed of Answer: Depending on the services provided by the agent the speed at which they answer the call could hurt or improve the customer satisfaction. If the caller is trying to reach a stock or mutual fund company to invest money the speed of answer (ASA) had better be very quick. Abandonment rate within these businesses is very low because the cost per lost call is extremely high. However if the caller is trying to reach an agent to talk about a problem on a product the ASA is not as important as the problem resolution. If the caller has to wait 10 minutes but the agent is empathic, efficient, accurate and helpful then ASA is not as important when it comes to the customer satisfaction. For the financial business the customer satisfaction rating will be based on how much the agent knows about transacting the services as accurately and efficiently as possible. Agents will follow rules and callers will be aware of this however the agent must do this with trust, efficiency, speed and accuracy. The daily business goals for the agent will justify the ASA targets for the agent. Revenue generating positions within the call center should have ASA on their mind along with calls waiting. Order cancelation, low priority support or general information calls might not be so concerned about ASA or calls waiting. 3. Communications with the customer: Communications includes: tone of voice, attitude, clearly stating the question or the directives to the caller, understanding the caller and being able to articulate back to the caller what they have stated, empathy, thankfulness for orders being placed and not just saying it. How the agent communicates to the caller may determine the customer satisfaction ratings. An agent requires the ability to understand the caller’s needs without getting negative with the caller. An agent that explains why they are asking for certain information will help the communications. However, doing so in a kind and understanding manner helps the customer satisfaction. Cultural differences between the agent and the caller can affect communications. If a caller is speaking to an agent in another country that agent may not understand slang or colloquialisms. An agent that apologizes for not understanding the caller will improve most calls from that point on. However, not all callers will be understanding with the agent. 4. First Call Resolution (FCR): Not all calls need FCR, but what they do need is accuracy, efficiency and clarity. The agent has to have the knowledge and be able to understand the severity of the problem with the caller. If the caller is not communicating the agent needs to be able to have the customer step back and go through all stages of the problem. However, this needs to be done at the knowledge level of the caller and not at the knowledge level of the agent. Resolving the problem together with the caller should be the goal of every agent. Agents that show an interest in the problem and a true desire to solve the problem will improve their customer satisfaction ratings with the customer. Clear communications with the caller and if possible through email and chat will show the customer that the problem is being tracked until resolution. Agents that treat callers at a very low level will not improve their satisfaction ratings even if they are able to resolve the problems. All problems should be treated with empathy regardless of the problem or resolution. Agents that are able to go to this level will receive high ratings from customers. 5. IVR Opt out: Too often we have to go through the IVR to speak to an agent. Some IVR’s have so many options that you are not sure which option is the right one for you. Also most IVR’s do not give you the option to just talk to an agent. It is understandable that if you talk to an agent and not go through the IVR that you will probably be transferred to another agent. That is ok since it will be the right group of agents anyway. This strategy is better than trying to go through an IVR that does not make any sense to the caller. Improve your customer satisfaction ratings by allowing callers to bypass the IVR and talk directly to an agent. It can be explained on the call that doing so will require your call may be put on hold or have to be transferred. These are ok as long as the caller is taken care of once the agent picks up the call. There is the option to offer to call the customer back. This can be a good option but it is important that the caller is actually called back. If your call center does not call the customer back then satisfaction ratings are sure to drop. If you state how long it will be before you will call the customer back be sure to follow up on time or the customer satisfaction will be affected. Customer satisfaction ratings are not always accurate. When a customer is very upset or pleased with the agent support they will complete the survey. More often the customers that are upset will be the ones that will complete the survey. If we could get all of our customers to complete a survey we would have a better idea of the true customer satisfaction ratings. Unfortunately for most businesses our satisfaction ratings and social reviews are most often completed by the customers that are most unhappy with our products and services. The truly happy ones or middle of the road customers do not always provide their feedback. So our goals need to remain the same and that is to always look for ways to improve our customer satisfaction ratings.